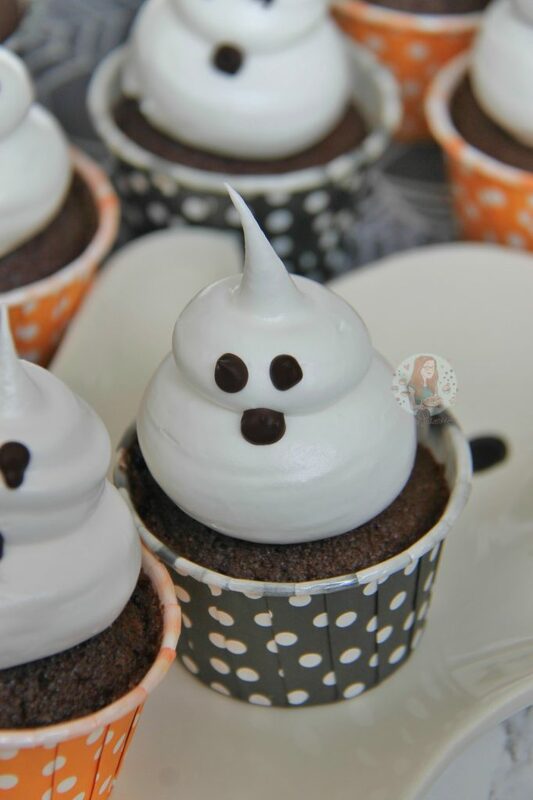 Chocolatey and Delicious Chocolate Cupcakes topped with an Italian Meringue to make Cute and Spooky Ghost Cupcakes for Halloween! So Halloween is well an truly upon us now. 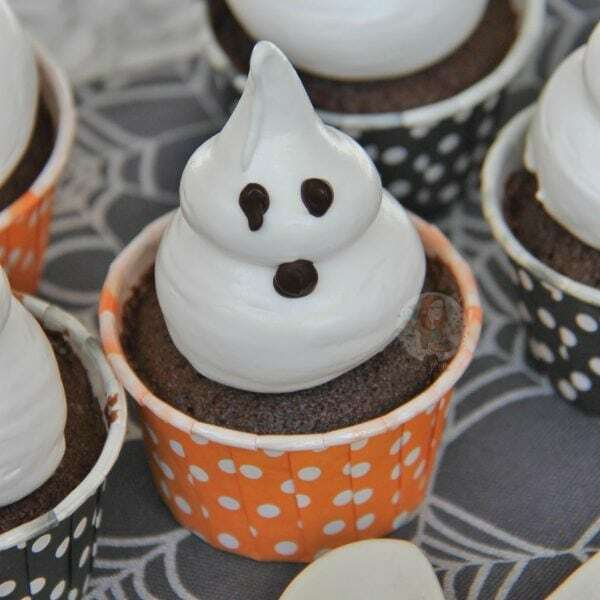 It’s really not that far away any more, and its the perfect excuse to make anything ‘spooky’! 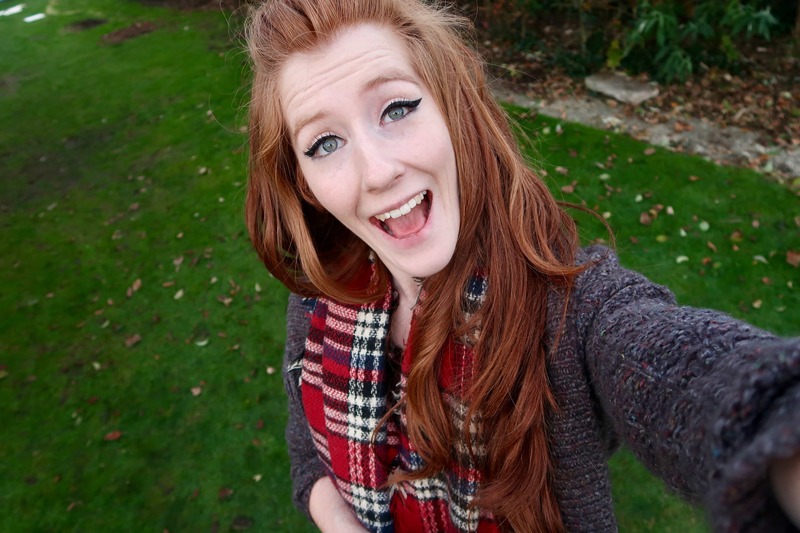 Lets be honest though, its not spooky at all but they’re still mini little ghosts and I will call the cute and spooky. 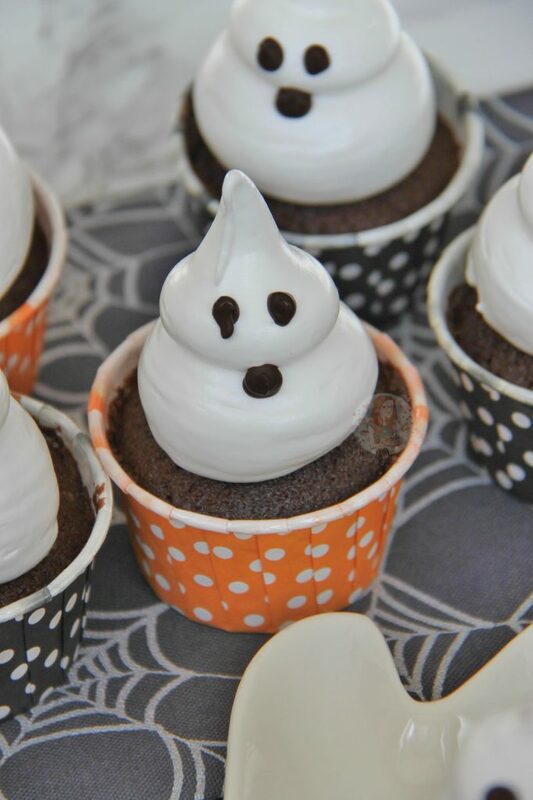 After the successes of my Halloween Drip Cake and Pumpkin Spice Cupcakes, I thought I should do some other Halloween baked goodies and these were too good to resist. When searching through Pinterest, there were so many cute little bits on ghosts, I wanted to do something Ghost themed! I wasn’t too sure how, but meringues seemed best. As I didn’t want to have to toast/torch the meringue so that it would stay brilliantly white, I went for an Italian meringue. This Italian meringue recipe is the same as the one I used in my No-Bake Lemon Meringue Cheesecake as its just such a delicious and beautiful meringue. It is a tad complicated for some people, and it does require a sugar thermometer and some confidence, but if you pull it off its wonderful. The amazing part of using an Italian meringue is that it doesn’t need to be browned off at all, as its already baked/cooked through the sugar syrup. I went for a simple chocolate cupcake and used a 100% cocoa powder and it made the cupcakes a really dark and beautiful colour. 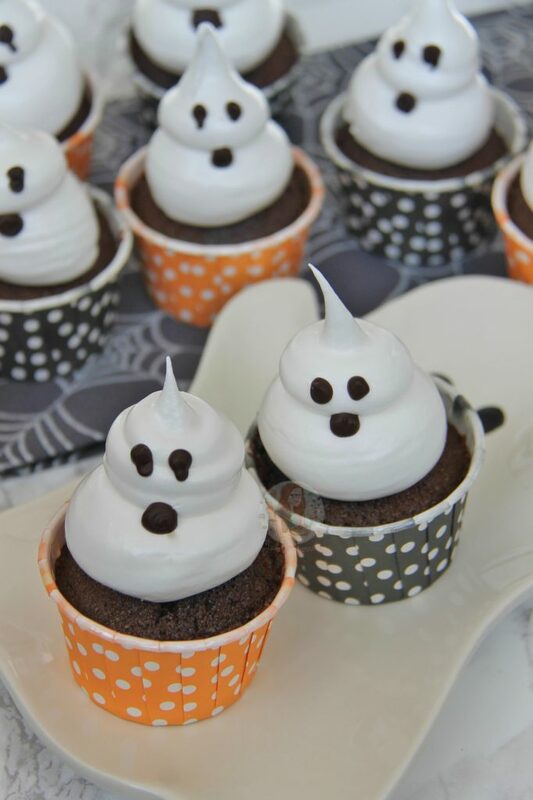 In my mind, it made it more spooky and it made them taste DELIGHTFUL! 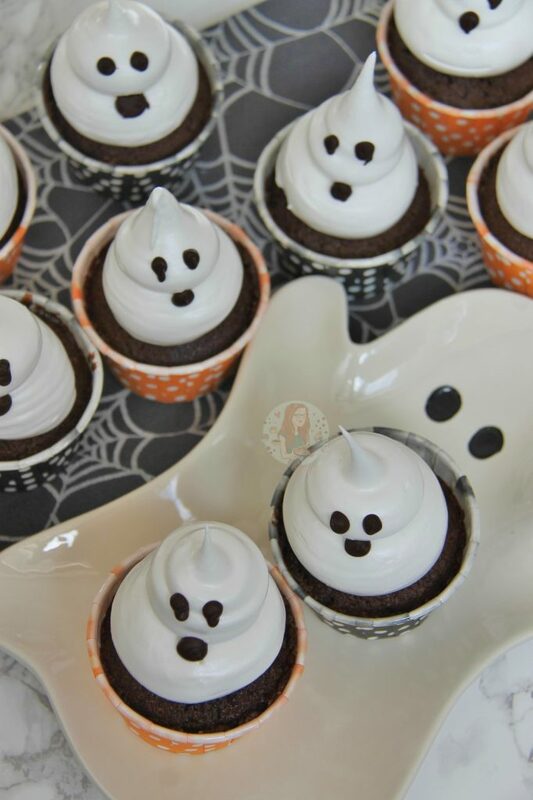 The contrast between the cupcakes and the meringue makes the ghosts seem even whiter! 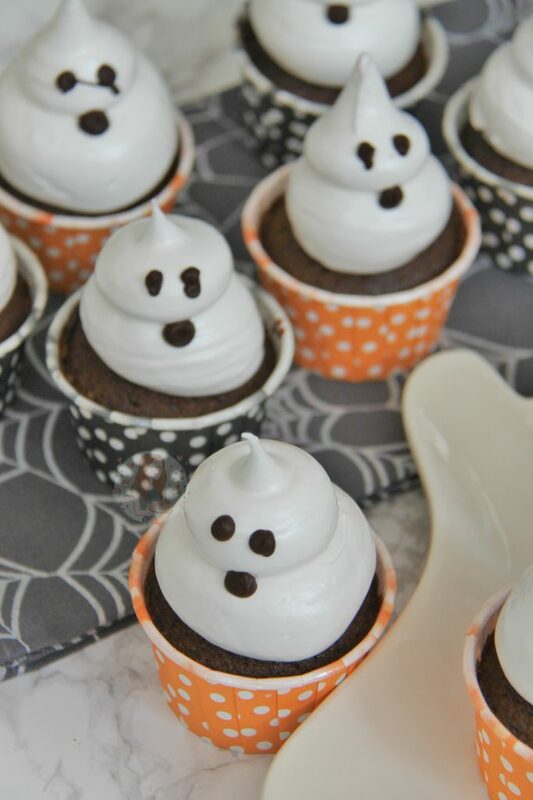 And then if you use some Iced Jems Baking Cups like the Black and Orange ones I did, they’d suit a themed baked ideally! Heat your oven to 180C/160 Fan/350F and line a cupcake/muffin tin with 12 Large cupcakes cases/Muffin Cases. Or 12 Iced Jems Baking Cups! 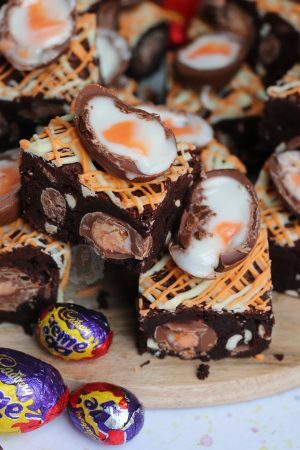 With a stand mixer – Beat the butter with the light brown sugar until light and fluffy – Combine the eggs, self-raising flour and cocoa powder with the butter/sugar mix until well combined. It won’t take too long to mix! If the mixture is too stiff you can add a little bit of milk at a time to get a smooth light consistency (Full-fat will prevent the mix splitting), but a good beating will do the trick. Spoon the mix into the cupcake cases evenly and bake in the oven for 15-20 minutes or until a skewer poked into one of the cakes comes out clean and they are springy to touch – leave them to cool fully on a wire rack. Pour the sugar and the water into a heavy-based saucepan and bring to boil, stir it occasionally with a wooden spoon. When the mixture starts to boil monitor the temperature until it reaches 120C (Firm Ball Stage) with a sugar thermometer! 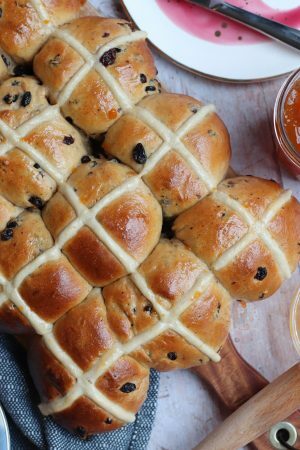 When the mixture is heating up and boiling, if any sugar splashes up the side of the pan, brush the sides with a pastry brush and cold water to get rid of it – this will stop the mixture crystallising and messing up! 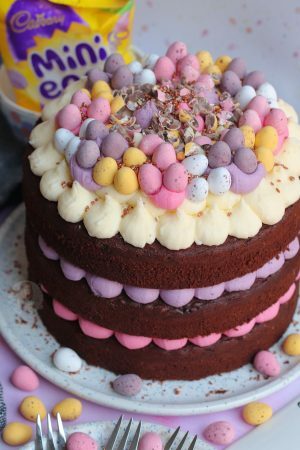 Whilst the mixture is starting to get towards the temperature whisk the egg whites in your electric stand mixer! When the sugar syrup has reached the temperature and the egg whites are at stiff peaks start to pour the sugar syrup onto the egg whites at the edge of the bowl whilst still whisking – make sure you do this slowly so its a constant trickle of sugar syrup so that the egg whites stay smooth! Continue to whisk throughout whilst the sugar syrup is pouring in, and after its all whisked in continue to whisk the mixture fast and on a high speed for 5-7 minutes until the mixture is smooth, and has cooled down. I then pipe on the tiniest little amount of dark chocolate to create eyes and a mouth but you could use fondant easily as well! Enjoy! If you don’t want to or don’t feel confident enough to make an Italian Meringue then you can do a normal Meringue using the 4 Large egg whites, and 200g of Caster sugar and mix like you would a normal meringue – however, the meringue will be raw this way. 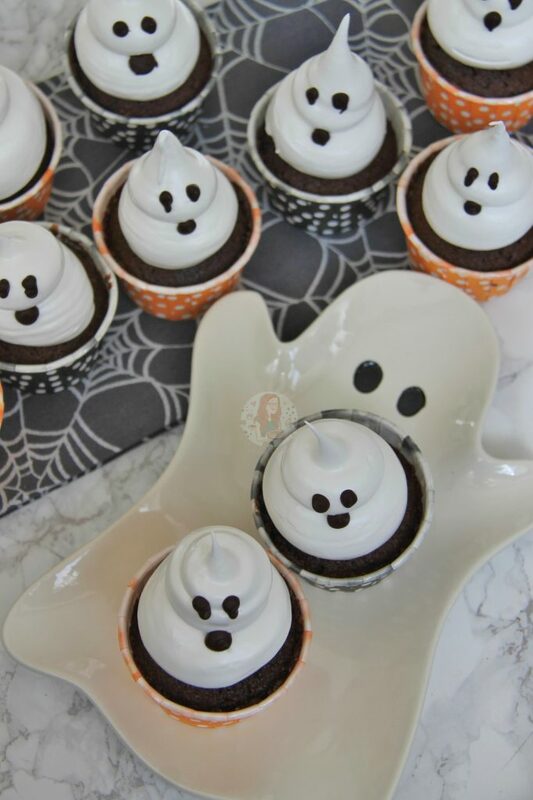 You could also make normal meringue, and then pipe the ghost separately and bake them like you would a mini meringue – you’ll just need to stick them on with melted chocolate! These spooky and delightful cupcakes last for 2-3 days at room temperature! I recommend these Large Disposable Piping Bags with a Large Round Nozzle! 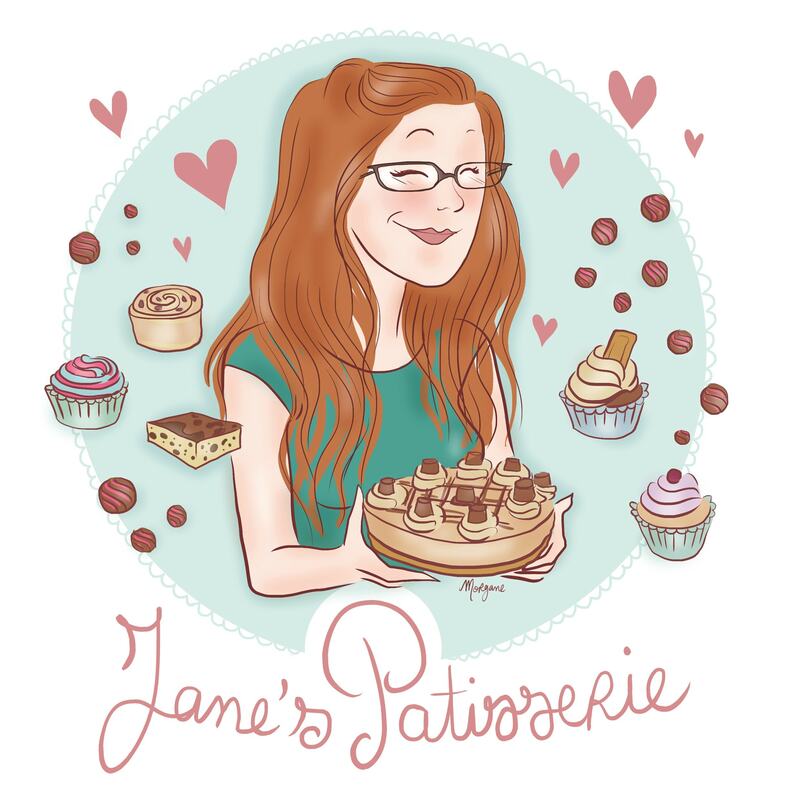 Older Next post: My 25th Birthday Cake! Newer Previous post: Baked Cinnamon Doughnuts!